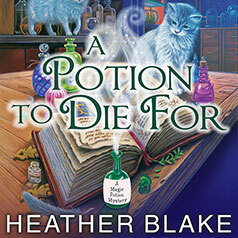 Heather Blake presents the first book in an entertaining mystery series featuring Carly Bell Hartwell, the owner of a magic potion shop. But when Carly finds a dead man in her shop clutching one of her potion bottles, she goes from most popular potion person to public enemy number one. In no time, the murder investigation becomes a witch hunt—literally! Now Carly is going to need to brew up some serious sleuthing skills to clear her name and find the real killer—before the whole town becomes convinced that her potions really are to die for. "If you like your cozies with a little paranormal then you will probably like this one." ---Books, Movies, Reviews! Oh My!